Despite a history going back three centuries, the highly controversial and politically sensitive proposed Kra Canal mega-project in southern Thailand is once again up for debate. At a forum held yesterday by Rangsit University entitled the “Stakeholders in Kra Canal@Klong Thai”, national security and the canal’s impact on tourism were among the main issues of concern as experts made their cases for and against the project. The forum urged the government to set up a national committee to conduct a feasibility study on all concerned aspects of the “New Gateway to Maritime Silk Road” project. General Pongthep Thesprateep, chairman of Thai Canal Association (TCA) – a group of influential former top brass soldiers advocating the project – called on the government to set up a national committee that can help reach a decisive conclusion on the long-envisioned channel that would run through the country’s southern isthmus. “The project has both pros and cons, so if the committee concludes that the canal would benefit the country it should be pursued, otherwise the proposed project can be scrapped,” Pongthep said, referring to many discussions about the project in Thai society for more than a century that had led to no clear decision. 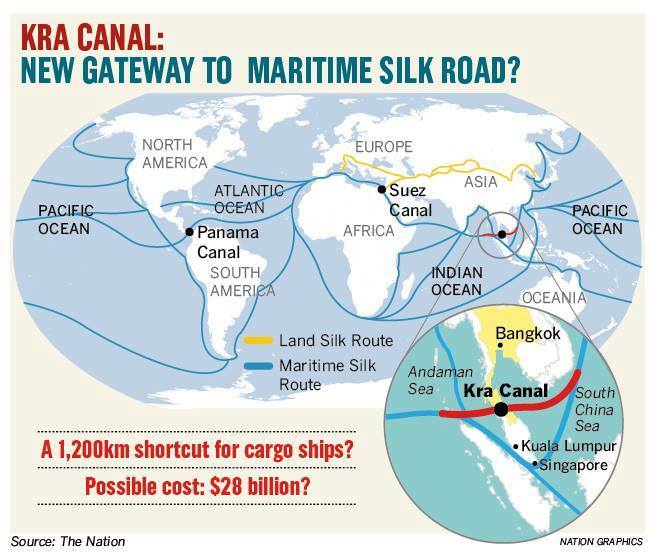 According to a study by TCA, he said the canal would benefit the country as it would connect the Indian and Pacific oceans and dramatically shorten East-West shipping routes. The TCA study claims that 65 per cent of people in the South, which will be affected by the project, were agreeable to it. Anek Laothamatas, the Political Reform Committee chairman who was introduced at the forum as an expert on the route proposal for the canal, said that in ancient times people travelled by sea hence he thought Thailand needed to exercise its “sea power”, as the Kingdom has an advantage in geo-politics. Thailand is among a few countries that benefits from its location between two oceans – Pacific and Indian – while China, a country 20 times bigger than Thailand, has access to only one ocean, Anek said. “It’s not a big deal or a new matter. We should not be afraid. We should be brave [to make a decision]. Our country has developed to this stage because we are linked to the sea. We should not see it as an obstruction but a linkage with others,” he said. Samart Ratchapolsitte, former Bangkok deputy governor and ex-Democrat MP, suggested that the government treat the project as state policy and initiate a Southern Economic Corridor similar to its Eastern Economic Corridor initiative. Samart supported the setting up of a national committee to study the project as he was concerned about the worthiness of the project or how many cargo ships would use the new route, as compared to the existing routes. An opponent of the canal project, Admiral Jumpol Loompikanon, a deputy permanent secretary at the Defence Ministry, said the country needed to balance geo-politics and geo-economics. Jumpol, a Royal Thai Navy spokesman and a member of the marine and coastal resources strategy panel, added that judging from the past he was worried about disputes arising between super powers and neighbouring countries. He cited the conflict over the Spratly Islands between China and the Philippines. He said it was difficult for security agencies to decide whether to pursue the project because more comprehensive information was still needed. Thon Thamrongnawasawat, the deputy dean of the fisheries faculty at Kasetsart University, raised concerns over the impact on tourism and environment if a canal was dug as proposed. The proposed route will pass some tourist attractions in the South, including Phuket and Krabi. The tourism industry generates around Bt3 trillion for the country annually and is ranked number three in the world, according to a report of the World Tourism Organisation, he said. Torn did not express an opinion on the project but cautioned about the dangers to tourism and the environment, citing the oil spill in the Gulf of Thailand, off the coast of Koh Samet and Map Ta Phut in Rayong Province in 2013. “What is the risk management going to be like? The proposed canal route would run past tourist areas in the Andaman Sea that generate about 40 per cent or almost Bt2 trillion of the total revenue from the tourism industry,” he added. Former Second Army commander Lt-General Tawatchai Samutsakorn, who supported the idea of setting up a committee to study the project, said Prime Minister General Prayut Chan-o-cha had told him that the premier would not be in power long enough to pursue the project. “Prayut told me that the right time [for the project] has yet to come,” Tawatchai, a former classmate of Prayut, told the forum. However, Tawatchai, who serves as vice chairman of TCA, believes any political party campaigning for the proposed man-made waterway, which will link the Indian Ocean and Pacific Ocean, could win at least 10,000 votes from voters in each of the southern provinces in the next election. Tawatchai claimed that former prime minister and chief adviser of the Democrat Party, Chuan Leekpai, whose political stronghold lies in the South, supported the project and said if the country delays making progress, it would lag behind other countries.